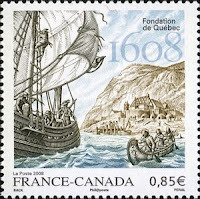 This 2008 stamp was a joint issue between Canada and France to celebrate the 400th anniversary of Samuel de Champlain's founding of Québec City. 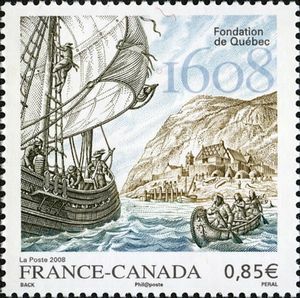 Here we see Champlain's ship being greeting by - perhaps - the Algonquins, or some other natives with the original Habitation in the background. I only have the Canadian one, but found the French version online, which is exactly the same but includes an explanation and year of issue. The stamp was engraved by Jorge Peral - a rarity in the 21st century - which rook five months to complete. From the Haunted Canada series (2016) we have Montmorency Falls, at Île d'Orléans just outside Québec. Legend has it that the tortured spirit of Mathilde Robin can still be seen and heard where she plunged to her death in 1759 after her true love was killed in battle (it was in the middle of the Seven Years War). Their marriage never came to pass, and she put on her wedding dress and flung herself over the falls, where she and her betrothed had spent many happy nights watching the sunset. If you should see her spirit in the water, it is said that you should keep your distance as no-one save her beloved Louis should touch her gown and 'unimaginable harm should befall anyone else who comes near it'. I love it - creepy Quebec! I love the haunted Canada series, the sets are e superb. ...I like the haunted one. 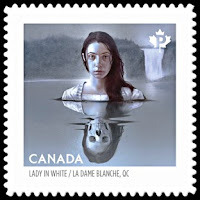 Marvellous detail in the Quebec stamp and the other is very spooky indeed, eek shiver. 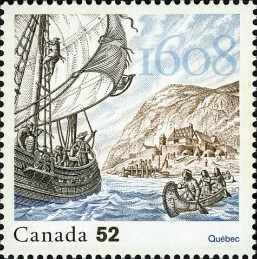 I love anything related to Quebec! And I will never eat a 'dame blanche' anymore without thinking of this poor sad lady..
Yeah, creepy Quebec indeed, but the stamp is beautifully haunting! 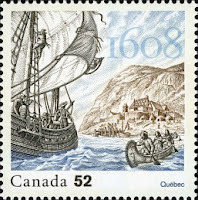 There must be many such stories covered by stamps but they are truly hard to find. Well done with this Quebec background.